This course will deepen your understanding of HIV and encourage respectful and compassionate skills for working with people who have an HIV infection. It also covers special concerns for working with clients who have tuberculosis, Kaposi's sarcoma and/or HIV dementia. This course meets the communicable disease requirement for Maryland and for most other states. How Is HIV Infection Diagnosed and Treated? 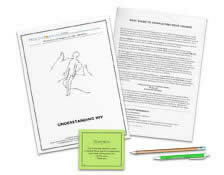 The course has relevance in all areas of massage practice. I found the course presented the information well. The information was of sufficient depth and the course format was very convenient. I found the course to be informative and insightful with case histories and statistics. Fits into my scheudle, without down time away from my clients. Website was very easy to use. The course was very organized in content. I think that this is the most informative HIV class to date. Others I have attended only covered a portion of what you have. Thank you for providing such a clear and informative CEU unit. Information was extremely beneficial-as bodyworkers to stay well-informed or current AIDs research as well as the benefits of Massage Therapy when working with clients afflicted with this disease. The course was very educational. I learned a lot of things about HIV and how I can help as a Massage Therapist. This course did a great job of reviewing the basics of HIV infection and transmission, as well as taking it the next step to relate it to massage and bodywork practice. I really liked the tone of this course. The writer really seemed to have compassion and a real understanding of what people with HIV/AIDS experience and how to be with them. This is a very informative, in-depth explanation of AIDs and HIV. One of the most up-to-date HIV courses I've seen. The text was easy to read. The test was very easy to complete and understand. The material was very easy to understand as well as the questions. The process of completeing my continuing education credits was very easy and I just wanted to thank you for making it painless! Concise information, well structured learning progression. This is an informative and easy to understand course in communicable diseases, universal precautions and HIV. I thought I would be bored, but found myself enjoyably learning a lot. Karen Hunter-Dixon CMT, CLT Finksburg Md. Thanx, very informative and made meaningful for a massage therapist. I really liked the breakdown of opportunistic infections with the description, symptoms and therapist precautions. The material was clear, concise and easy to read and comprehend. This is well-organized with good material. The information in the course was straight forward and can be applied for use while working with clients. A thorough and compassionate overview of HIV/AIDS care for all massage practitioners. Class was great- covered the MD state requirements. Covered the topic of HIV/Aids very thoroughly! The textbook was very comprehensible and informative. This course was well-written and full of helpful information. I think all CAM practitioners can benefit by learning about the causes, symptoms, and treatment of HIV. A lot of thought and preperation has gone into this course. Excellent review as well as important new information on working with a very specific population. For someone who doesn't test or have high quality reading comprehension capability, this course was easy to follow and I actually learned something important. Excellent presentation and references. One of the best home study courses I have had opportunity to take advantage of. The course is great. It was many things I did not know until I took this course. This was a joy for knowledge.